Once in a while things don’t go according to plan. Fate has decreed that today will serve as a demonstration of that principle. We spent the last two days packing for an 11-day trip to southern California. Eleanor hustled mightily to get all her stuff ready for the Airstream; she’s got big culinary plans in addition to the usual challenges of packing up a household and child. I was busy too, packing, testing, filling, tweaking … Around 2 p.m., while Eleanor was making her finishing touches, I pulled the trailer forward a few feet and found that we had no brakes. The disc brake actuator (a hydraulic pump) had failed. I knew at that moment we were probably screwed, because we’ve had a long history of problems with brake actuators. The unit was made by Actibrake, a company that has since disappeared, and whose legacy is hundreds of brake actuators that are known to suffer sudden failure. This is our third Actibrake, and we have it only because when the prior two failed they were replaced under warranty. For the past three years I have considered preemptively replacing this one to avoid a possible inconvenience, but since a replacement unit would cost $600-700 and this one was functioning properly, I let it go. And so, it died in our carport without even a whimper to warn us. But to be sure, I ran through the usual checks. I added a little brake fluid, since it seemed low. I cleaned the main ground for the trailer with a Scotchbrite pad. I checked the 30 amp fuse that protects the unit, and all of the other fuses too. With Super Terry on the phone, I verified power was going to the unit and that the ground was good. I power-cycled it by disconnecting the battery. I even banged on it a little. Nothing. Dead dead deadsky. So I told Eleanor, “We’re not going today,” which was no surprise to her by then, and I got on the phone to see if anyone in Tucson had a replacement unit. At 3:30 pm on a Saturday, New Year’s Eve to boot, I didn’t expect much but I did get one RV parts store that was willing to order in a Dexter or Carlisle replacement actuator on Monday. So the very best I can hope for it is to get one on Tuesday. If I install it myself and all goes well, we could be on the road Tuesday night or Wednesday. I think the fact that I made reservations for this trip is karmically jinxing us. We don’t usually make reservations, and often when we do, we come to regret it and pay lots of cancellation fees. That’s going to be the case for this trip. Super Terry pointed out that we have a “backup” trailer, our 1968 Caravel. So I picked up the Caravel from its parking spot and delivered it alongside the disabled Safari, and we started figuring out how to fit at least some of 30 feet worth of stuff into 17 feet. It’s not easy. The Caravel is a weekender. The refrigerator is 1/3 the size of the Safari’s. Storage is extremely limited. It’s so small that when one person stands up to do anything (cook, make a bed, get something out of storage) everyone else has to sit down. Things are quite different now. Emma is over five feet tall, she travels with an immense collection of books and stuffed animals, and we have the added complication that she has a nasty cold at the moment. But what can we do? If we wait until the new brake actuator arrives, we might be on the road Wednesday. That would cause a huge ripple that would eliminate much of the plan we’ve carefully laid out over the past few weeks. And still something might go wrong that could cause a further delay. Taking the Caravel is the best option we have to salvage at least some of the plan. So we’re re-engineering everything. About a quarter of the stuff we were bringing along is now staying home (but the Dutch oven is still coming!) The Mercedes will now serve as our outside storage, loaded up with all the things that won’t fit in the Caravel. (I don’t normally like to carry a lot of stuff in the car when towing the Safari because of weight limits, but the Caravel puts very little weight on the car so we are free to pack it full.) Some plans that required big refrigeration are getting scotched, other plans are being modified. We worked on this until about 7 p.m., but we need a lot more time to get it all figured out. If we can figure it all out by tomorrow afternoon, we’ll get on the road and just miss our first night in the campground. If we need more time to pack or if Emma needs more time to get over the worst of her cold, we might leave Monday instead. All we can do is be flexible. So tonight Eleanor broke out the cheese fondue that she had planned for our New Year’s celebration on the road, and I’m making popcorn for the movie we’ll watch. It’s an enforced “staycation” tonight. Not the New Year’s Eve we had planned, but a memorable one nonetheless. Although we are in the desert southwest and have a mild winter that allows camping, it’s still winter. That means the nice low-70s sunny day quickly becomes a frigid black night after the sun falls, and if you are camping with a mountain range to the west, the sun stops warming you around 4 p.m. The effect can be startling to people who aren’t used to the climate. It’s typical for the temperature to fall 30 degrees in three or four hours because the dry air doesn’t hold warmth and we have no large bodies of water nearby to moderate the swing. But the desert offers some intangibles that make it worth a little chilliness. The winter days can be startlingly clear, with fantastic views through clear blue sky for a hundred miles. Daytime hiking is superb, and there’s always lots of room to find your own campsite. The past few years we have spent New Year’s Eve in Anza-Borrego Desert State Park, about 70 miles south of Palm Springs. We like it for the peacefulness (we don’t go to have a blowout party). Every New Year’s Eve the primary sound we hear is coyotes howling, and occasionally a breeze blowing through the long fronds of the palm trees. Last year we were joined by Alex & Charon, who travel with a substantial collection of cast iron cookware. Alex gave me my first instruction on Dutch Oven cooking, a subject I’ve been interested in since we ran an article on the subject in the Fall 2010 issue of Airstream Life. 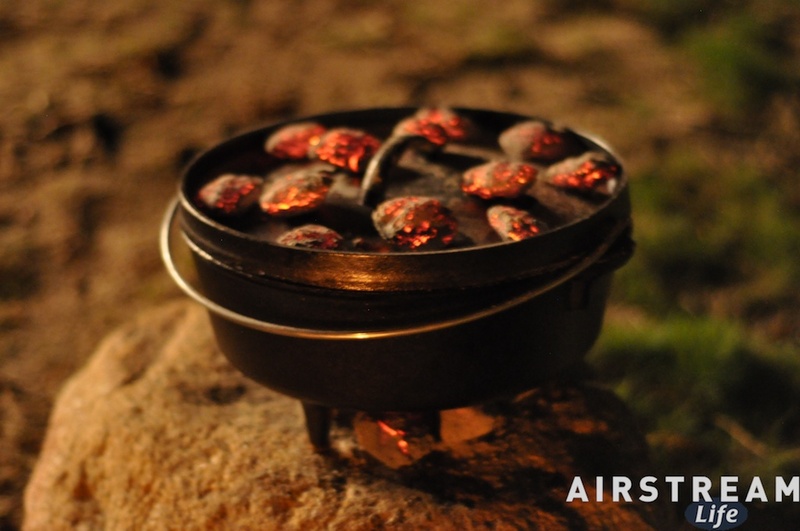 Alex piled some hot charcoal atop and beneath his Dutch Oven and baked us a nice dessert. The combination of glowing charcoal, and a nearby campfire with a roast on an iron spike, reminded me of reading about the exploration by Lewis & Clark. They cooked in much the same way, over a century ago as they walked and canoed across the new American wilderness. It transformed the cold dark night into a great camping experience, full of delicious scents and great karmic rewards. So it was with pleasure that I received a late Christmas gift: a #10, Lodge four-quart Dutch Oven, a gift from my mother. It comes with a booklet entitled, “Dutch Oven Cooking 101,” to get you started. I’ve been studying it and planning out a few basic recipes. Today I am going to get some charcoal and some welder’s gloves, and piece together a complete set of tools and ingredients so that I can try some Dutch Oven cooking of my own next week. What better time and place to learn this new skill, than out in the desert at night, with no distractions and plenty of time? Of course, there’s a small fear of committing some heinous Dutch Oven error and producing a charred or inedible dish. I’m not generally known as a cook, although I do a lot of grilling. For this reason the Weber Baby Q will also come with us. It’s my safety net. I’ll just stick to “optional” items with the DO, so if my experiments turn into charcoal briquettes themselves, nobody will starve. Tomorrow we are going to seriously start prepping for the trip. Already we’ve been buying groceries and making lists of things to bring. The Airstream itself is kept mechanically ready to go at all times (empty holding tanks, cold refrigerator, cleaned, fresh bedding, etc. ), so our efforts will be focused on packing our personal stuff. Since we only anticipate being out for 10 days or so, it should be a straightforward job compared to the usual challenge of packing for several months. We’re not just staying in the desert this time. Our route will take us all the way west to the Pacific Ocean. Depending on circumstances, we may make a second stop in Anza-Borrego on the way home, or make a longer trip out of it up the Pacific Coast Highway in which case we’ll be out a little longer. Friends have popped up all along our route, which is always superb. We’ll see Bert & Janie, Leigh & Brian, John & Helena, David & Ariadna — Airstreamers all — and perhaps a few other people. So it’s shaping up to be a great trip. We’ll hit the road on Saturday and I’ll blog regularly as we travel. OK, that’s all the musing. One random note: We still have a few spots available at Modernism Week 2012 (Vintage Trailer Show), Feb 25-26. The Mod Week people have sweetened the deal for trailer owners. Now for your $95 entry fee you get one free night of hotel (a $100 value right there), two receptions, a chance to win one of three Airstream Life awards, an electrical hookup if you want to stay in your trailer, and a pump-out at the end of the event. It’s a great way to meet a lot of really cool people, and we always have a wonderful time. All you need to participate is a very nice vintage trailer of any make. It’s a great reason to visit Palm Springs and check out some of Modernism Week. 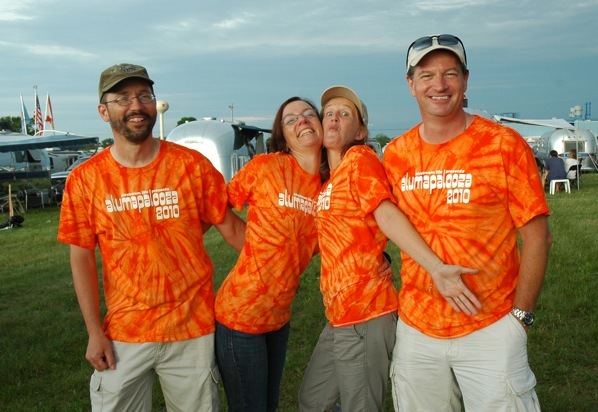 If that sounds like fun to you (and it really is), ping info@alumapalooza.com for an application form & details. It’s a few days before Christmas, but instead of sugar plums in my dreams, I am looking forward to our next Airstream trip. Don’t get me wrong—this holiday week has already been great, and we’re looking forward to a nice quiet week between Christmas and New Year’s Day. Emma and Eleanor are decorating the tree as I write, and some fabulous holiday meals are pending. Seasonal tunes are playing in the background, and tonight we’ll light a fire in the fireplace. It’s a great time. We even have a 10% chance of snow tomorrow, which is pretty awesome for Tucson. But the big highlight of this time of year has lately been our annual trip around New Year’s Eve. Typically we pack up the Airstream and get lost in the southern California desert for a week or so. This year we’ll do that, and a bit more. The trip plan has been stretched to include a jaunt up to Santa Barbara (CA). I am not sure how long we will stay out, but it will be at least ten days … and you know how susceptible we have been in the past to ad-hoc trip extensions. Once we’re on the California coast, it may be hard to convince ourselves to head back home. The holidays are great times to be Airstreaming. We’ve spent many Thanksgivings, Christmases, and New Years Eves in our Airstream—every one memorable for the great places it has taken us. All of the holidays we have spent at home have melded into one blob in my memory, but I remember clearly the Christmas in San Diego, the Thanksgiving turkey Eleanor cooked in the redwoods, picking out seven fishes for a Christmas eve meal at St George Island (FL), and all of the great New Years we have spent in Borrego Springs. Holidays seem special when we spend them in the Airstream. The small space encourages us to get outside and absorb whatever holiday vibe the local area has to offer. The Airstream is always peaceful in a campground on a holiday. It feels like the world has gone away for a day, and left us alone to enjoy each other’s company. And it never feels like the sort of horrible travel experience people normally associate with holidays. We move at our pace, free from airport crowds and TSA body searches, not rushing on a snowy highway to get to a relative’s house, not pressed to be anywhere, far from home and yet still at home. We spent so many holidays in the Airstream that when we finally bought a house it was a huge novelty to spend Christmas eve in it. The house was uninhabitable because of all the renovation going on, but we cleared a space in the living room, made a fire, and slept on the floor in sleeping bags just so we could wake up by the tree. I like having the choice of home or Airstream every year, although we typically select the house for Christmas and the Airstream for New Year’s Eve. Of course, in most of the country it’s hard to get out this time of year. Most people have winterized their Airstreams for the season, and would be facing drives of 1,000 miles or longer just to get somewhere that the weather is reliably above freezing during the day. But even if you can’t tow, you can play. Does your Airstream live in the driveway? If so, can you get a power cord to it? That’s all you need to “camp out” for a few days. Seems silly, but I know lots of people who do it all the time. It’s just the change of scene that makes it fun. It’s an adult version of sleeping out in the backyard in a tent. Decorating the Airstream is easy, too. It doesn’t take much to make it festive inside: a string of lights or two, a little rosemary bush trimmed to look like a miniature pine tree, a few small presents, and maybe a pie or some cookies. Perhaps a little Christmas music on the iPod? Add in your favorite beverages and some fuzzy slippers, and you’re in business. Curl up on the bed or couch and watch a Christmas movie with someone you love. And while you’re doing it, think about places you want to go. Call up the Ghost of Christmas Future and ask him to show you where you’ll be spending the holiday some other year. The world is wide open, and if you already own the Airstream, all you need is a little time. Don’t wait for “someday.” Happy holidays—this year and next! I’ve been talking about this for far too long. It’s a monstrous, scary, bewildering job. I’m talking about turning the three years of the Tour of America blog into a book. Time and again I’ve said I wanted to encapsulate that epic into something portable and readable, but every time I looked at the task it was so intimidating that I found something else to do instead. Once I actually wrote about 80 pages, and then abandoned it as a terrible effort. At another point I published a series of three essays on the blog in the hopes that going “public” would embarrass me into completing the job. But nothing has worked. It has been three years since we stopped full-timing, and probably five or six abortive attempts at re-writing the story, and it continues to be a sort of literary Don Quixote-windmill that thwarts me. I am taking another run at it now. This time I’ve approached it by downloading the entire contents of the blog to use as notes. This has already turned out to be tricky. See, I was rather prolific in writing about our travels, to put it mildly. This is normally a good practice for a writer, because the blog entries and 10,000+ photos comprise all the information I need to augment my memory. But I wrote six days a week, averaging about 900 words per blog entry. Multiply that by three years and the result is smothering: over 800,000 words in total. That’s the rough equivalent of a 1,600 page book. It’s almost double the length of The Count of Monte Cristo. At least Dumas had the excuse that his story spanned decades. Don’t get me wrong—I think our story was mostly interesting, but the sheer size of it is impractical. Not only is it too much information to sort through, to keep it unabridged I’d have to publish it as a three or four volume set —at least— and that’s without any pictures. The cost of publishing would be prohibitive. And it would be boring. So it has to be trimmed down, and therein lies my first challenge. Just getting the data down from the web was a hassle. WordPress doesn’t have a handy plug-in (that I could find, anyway) to export blog posts to a Word processing format. I finally used a web service that converted the entire blog into a PDF, including the photos. The resulting PDF took about half an hour to generate and massed 155 megabytes. I converted that to text and imported it to my word processor, and now I’m cleaning up the result (removing extraneous detail and spam comments, etc.) So far I’m 600 pages into the document. It will take a couple of weeks to complete the first pass, if all goes well. This is just the beginning. Then I have to start writing, with a copy of the cleaned-up blog at my side. It doesn’t work to merely publish the blog entries chronologically as a book. In that context it just seems strange and disconnected. So the actual book will have to be mostly new material—a re-telling of the blog story, in past tense. Still, I think that I would like to retain it as a moderately long travel story. There’s no plot to our travel story, no climax at the end, no whodunnit. It’s just a series of lessons and experiences, the way life is. So instead of trying to trim to 200 pages, which would be a comfortable length for publishing, I will probably let it run quite a lot longer. I want to include lots of color photos, too. For these reasons, the book will probably never be printed on paper. I expect it to be something you can only read on a Kindle, iPad, or similar device, where there’s no financial repercussions from being long-winded. But I hope—if I ever get this beastie under control—lots of people will read it and be inspired to do things that change their lives for the better, too. ’tis the season to get things going! So for the past week I’ve been tap-tap-tapping at the keyboard and relentlessly thinking about the future. This is the winter and in the winter it always seems that I have too little to physically do but too much to think about. There are so many interesting plans to execute. “What’s next?” is the question on my mind when I wake up, because for me, ’tis the season to get things done in preparation for an even more interesting 2012. It has always been this way for me during the winter. In the past it was easy to get bogged down in the minutiae and the winter doldrums, but since 2003 when we began Airstreaming I have not had that issue. Wally Byam was right when he outlined the Four Freedoms that result from Airstream ownership, one of which was “the freedom to relax and lose oneself mentally.” For me, the Airstream is a vital tool to regaining perspective that might otherwise be lost in the press of work and ideas. Every year since 2004 we’ve spent a week or more around New Year’s Eve to get lost somewhere sunny, and not think about the things that need to get done back in the office. I’m looking forward to that trip. That’s a few weeks away still. In the meantime I’m energized by the prospect of all the interesting possibilities that life presents. My challenge is to push things and people along the path so that every idea can get closer to fruition. It’s a rather delicate process. I can’t just pick up the phone and yell at people to get their jobs done. There are always obstacles to every project, and there’s never enough money. So I spend a lot of time figuring out clever ways to circumvent barriers and financial limits (with the help of a few trusted advisers and partners), and then gently applying pressure in the right spot. This is actually fun. I do get a kick out of seeing ideas become reality, even if they’re not my ideas—and they often aren’t. Of course, it’s important not to lose sight of the crown jewel that makes all the other projects possible: Airstream Life magazine. I still spend most of my time working on it. The magazine’s Spring 2012 edition is about 80% through the editorial process at this point, and going to layout as of today. We are going to have articles on the 1958 model year Airstreams (continuing the series by Fred Coldwell), a Buyer’s Guide on 30-foot slide-outs, a very interesting Airstream with a Victorian interior, a personal perspective on Chaco National Monument by Bert Gildart, the Shooting Star Drive-In (Airstream park), an Airstream barber shop, a soap opera star’s customized Airstream in Hawaii, another article in Andy Thomson’s towing series, and more. This issue will be in the mail in February. By the way, it’s going to have a really cool cover illustration. 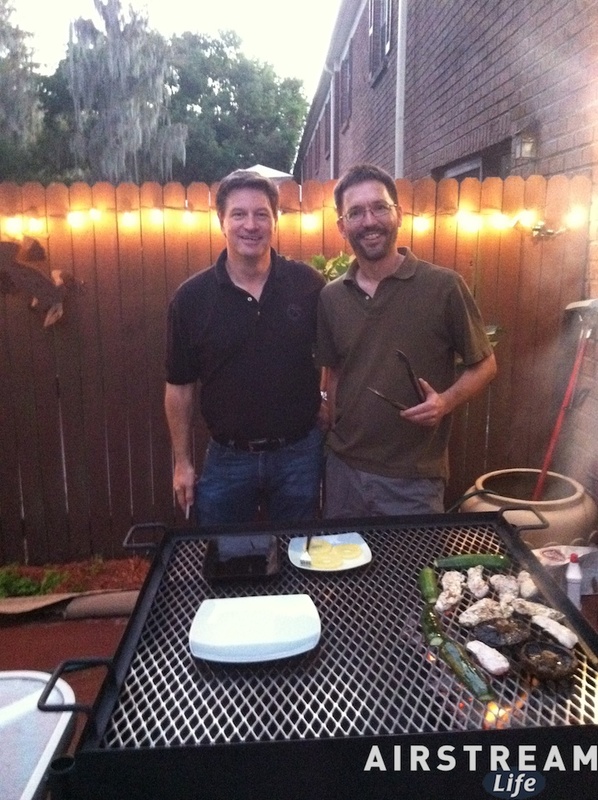 While I was sick in Tampa last week, I had a lot of time to talk to Brett about our plans for Alumapalooza 2012. The event is coming together very nicely. We would have a much easier time if we simply replicated the event each year, but we like to change it up. That way it’s never predictable, so people who come two years in a row won’t be bored. And, we like to look for efficiencies that make the event better. But in my opinion the best idea we’ve had is a new format for “the process formerly known as registration.” Last year people were waiting in a line to confirm their registrations on site, and it was kind of a drag in the hot sun. This year, we figured that since you’ve already registered online for the event, there’s no reason to make you wait in line when you get to Alumapalooza. So when you’re there in 2012, either before or after you’ve parked (your choice), all you have to do is approach any orange-shirted staff member anywhere and tell them who you are. Most of the staff will be able to check you in, on the spot, using a wireless mobile device. The process will take about 30 seconds and you’ll be handed a plastic token for every paid member of your group. Ta-da! You’re checked in and ready to start having fun. At your convenience, you can swing by the Vendor Tent or visit the daily 4 pm Wally Byam Happy Hour under the Main Tent and exchange your plastic token for your personal badge, which will get you into all the seminars, qualify you for door prizes, get you dinner on Saturday, etc. The primary registrant in each group will also get a goody bag full of coupons and freebies. No lines, no waiting, no hassle. I love this sort of stuff. We didn’t have to make this change, and it will cost us some bucks for the added technology, but it’s going to make life easier for everyone and allow our attendees to get right to the job of having fun. I know when I get to a campground after a long day of driving, the last thing I want to do is wait in line at the front desk and go through some overly-complicated registration process. Getting geeky with our technology to eliminate that tedium is very satisfying. OK, let’s talk about another project: This week I am pleased to announce the Airstream Life has published another book, “The Collected Adventures of Tin Hut.” It presently is available only in ebook format (Amazon Kindle right now, Apple iTunes bookstore for iPad & iPhone in a few days). The book is a complete set of every Tin Hut episode ever published in Airstream Life—a total of 22 episodes, complete with the original illustrations by Brad Cornelius. It’s pretty damn funny. The price is just $9.95. We’re working on a softcover print edition to follow next year, which will probably be more expensive because of the cost of color printing. I have four other book projects waiting in line right now. They’re all going to be great (I say with as much modesty as I can muster) but each one has a set of barriers holding it back. With luck, I’ll be able to announce two of them next year. Even when I’m not writing the books, it’s a huge job just to get each one out the door. I love doing them despite the hassles. By the way, speaking as a print publisher, I think ebooks are the way to go. I can offer more titles at lower prices, especially books that would never see print because their audiences are too niche. Some titles must be in print for logistical reasons, but I’ll always offer an ebook edition at the same time. Another announcement: the free Airstream Life Online Edition is now compatible with Apple iPad. I get emails almost monthly from people wondering when they’ll be able to read it on their iPad. Now you can. iPad users, try it here. The underlying software is still in beta, so it’s not quite perfect but we’ve been promised that the platform will get better in the next few months. Events: There’s more in the pipeline that I can’t talk about yet, but trust me, it’s good stuff. Hopefully we will be able to announce a second major Alumapalooza-type event, out west, for next summer. We’re just waiting for confirmation that the venue is available, and then we’ll open up registration. And we are already at work on a third event for February 2013. Each event will have its own name and be completely different, so rather than Alumapalooza 1, 2, and 3 clones, they will be more like a set: collect ’em all. This is really fun work. I just wish we could make it all happen faster. One last announcement. I’m once again working with Brett to curate the Modernism Week 2012 show in Palm Springs. The show will be February 25-26. For information on times and tickets, visit Modernism Week’s website. We have space for just 20 exceptional vintage trailers at the show, and already half the spaces are taken by some unbelievable restored and customized rigs, including Randy Grubb’s one-of-a-kind Decoliner. It’s going to be an awesome show. Modernism Week is a different kind of display opportunity from vintage rallies. When you go to a rally you are showing off your trailer to other trailer enthusiasts. That’s nice, but you’re sort of preaching to the choir. At Mod Week, nearly 1,000 people who aren’t yet vintage trailer owners come from Los Angeles and southern CA specifically to see what’s cool. They don’t know trailers, but they know what they like and they love good design. That’s why lots of smart trailer customizers and vendors of trailer-related products are bringing their best rigs to Palm Springs for this show. Airstream will probably be there to show their new Sterling concept trailer too, and we are hoping Chris C Deam will put in an appearance at the same time. To encourage the best of the best, we have put together a special owners-only program which includes a private reception before the show, tickets to an evening event/party at the new Saguaro Hotel, and a chance to win one of three coveted Airstream Life “Wally awards.” If you’ve got a sweet vintage trailer of any make (not just Airstream) and want to be considered for the show, just ping us at info (at) alumapalooza.com for the application form. This is only about half of what’s on my plate. You can see why my head is swirling right now. There’s so much fun stuff out there to work on! I’ll keep pounding away at the keys and working the phone this winter so the Airstream and vintage-trailer lovers can have a great 2012—and I will too.